Be the first to share your favorite memory, photo or story of Patty . This memorial page is dedicated for family, friends and future generations to celebrate the life of their loved one. Patty May Coleman, age 86, of Pikeville, Kentucky died Friday April 5, 2019 at her residence. She was born in Pikeville, April 29, 1932, a daughter of the late William Earnest “Earl” and Roberta Irick May. 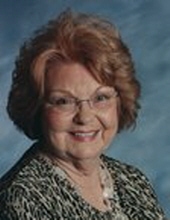 Patty was a bookkeeper and a member of the First Baptist Church of Pikeville. Other than her parents she was preceded in death by her husband, Herbert Ronald Coleman, her brother, Walter E. May and her sister Dorothy May Todd. Patty is survived by two daughters, Linda (Rick) Coleman Steele and Lisa (Mike) Coleman Patrick; five grandchildren, Richard Micah Steele II, Jaime Steele (Chris) Coffey, Angela Blair Robinson (Ryan) Altman, Jasmine Lee Robinson and Timothy Scot (Kelli) Robinson; six great-grandchildren, Brooklyn May Steele, Richard Micah Steele III, Lyla Grace Coffey, Davis Webb Coffey, Ashton Scot Harding and Ari Scot Blankenship. Visitation will be from 6-9 PM Sunday at J.W. Call and Son Funeral Home. Funeral Services will be 1 PM Monday at the funeral home with Scot Robinson officiating. Burial will follow in the Johnson Memorial Park at Pikeville, Kentucky. To send flowers or a remembrance gift to the family of Patty May Coleman, please visit our Tribute Store. "Email Address" would like to share the life celebration of Patty May Coleman. Click on the "link" to go to share a favorite memory or leave a condolence message for the family.